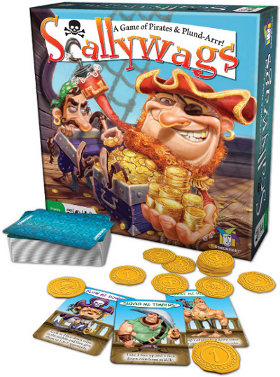 Scallywags is a light-hearted game in which players take on the role of swashbuckling pirates divvying up their booty. To begin the game a selection of coins are dumped in the center of the table forming a pile. The coins are only marked on one side and are left as they fall (face up or face down.) On a players turn they use cards to take coins for themselves or give them to their opponents. Play continues until all players have a certain number of coins (8 for 2 or 3 players, 6 for 4-6). Players add the value of all their coins and the pirate with the largest take wins!